A quick ink sketch using a brushpen, which I then scanned and pushed further in Photoshop. The experiment was to try and make both traditonal and digital inking work seamlessly together, so you couldn't tell where one ended and the other began. 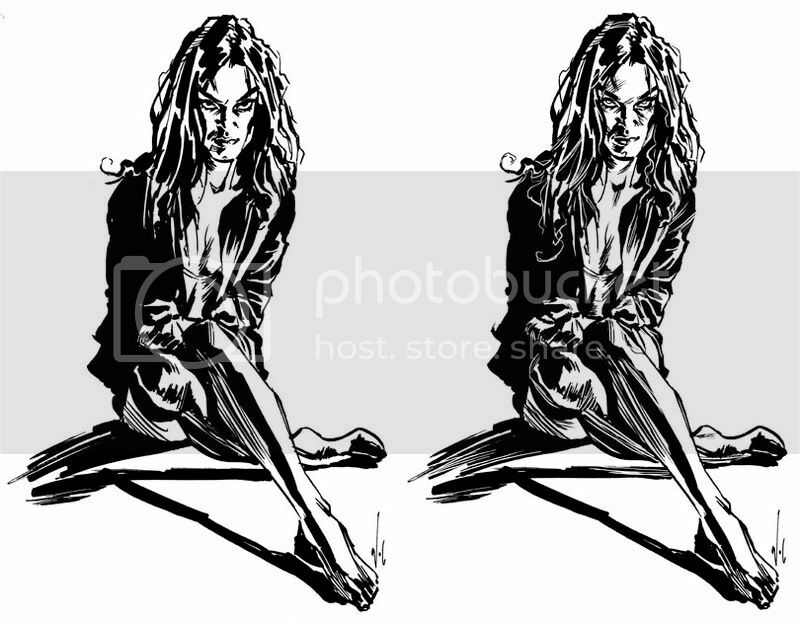 Here is a side by side comparison of the original brushpen version and the Photoshopped version. Personally I'm starting to prefer the simplicity of the original. Hey Chris.... Great lines.... super different from other things I've seen... PEACE! Great sketch! Either she's about to, or she just did something evil, I bet she scares off a lot of men!!! Nice job on the digital, can't tell at all, but I must agree with you the original is better. There's a stronger contrast, which makes her expression much more clear. I think it's mainly her pronounced eyebrows, that seems to be fading a little in the digitally "enhanced" version. Thanks for posting your work methods, I'm really gaining a lot from it. P.S. lol Hans that is! Nice junkie look :) I like the looseness of the line. I have to agree that the original sketch looks better - I think it was pretty busy to begin with so I think you might have gone the other way and simplified it in digital. Thanks for a great blog by the way! Thanks for your kind words and opinions. They help a lot.